At GMC we are blessed to be able to offer you a choice of 3 great venues in one. Ideal for either business, leisure, community or social use. 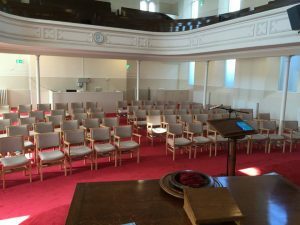 As we are right in the heart of the City of Dunfermline there is no better location to hold a conference, educational workshops or even a concert. Our Sanctuary: The Sanctuary has been loving refurbished and renovated to give it a lovely warm, welcoming and modern feel. Great for a conference, exhibition or a concert. With seating downstairs and up in the gallery. Capacity 350 people max. The centre has recently undergone a £250,000 refurbishment to create a multi purpose space. The centre offers a selection of competitively priced rooms from Monday to Sunday: one main hall plus two addional meetings rooms. All rooms are well furnished and equipped and can be booked for various time spans. Main Hall – 60 people. Small Interview Rooms – 4-6 people. Audio Visual Equipment. Fast internet access at no charge, wired and Wi-Fi. 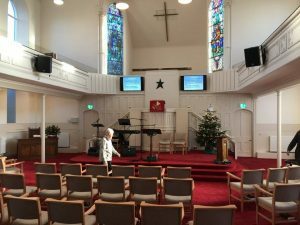 Our Church hall is a great space for organisations and can hold around 100 people, and is very popular with local community groups that meet on a weekly basis so please give us plenty of notice to confirm your required date. The hall can function as one large space or be divided into 2 halls to create a more intimate space, ideal for smaller groups. A kitchen is available for any catering needs, either private or outside caterers. For more information on any of the above and to book your venue please email us at office@gillespiechurch.org.